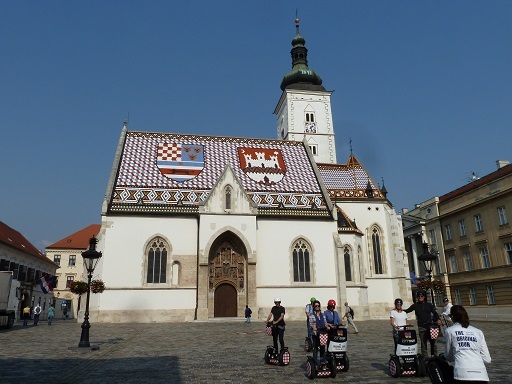 It may not have an Eiffel Tower, Colosseum or Trafalgar Square, but what the Croatian capital lacks in monumental icons, it does have a treasure or two of its own. Topping the bill is the Museum of Broken Relationships in the city’s Upper Town. Dedicated to failed love relationships, the museum’s exhibits include personal objects left over from former lovers, along with brief descriptions. The award-winning museum, founded by two Zagreb-based artists – a film producer and a sculptor – was set up as a travelling collection of donated items, but is now in a permanent city location. After their four-year love relationship came to an end, the two men joked about setting up a museum to house the left-over personal items. But it was not until three years later when they started asking their friends to donate objects left behind from their break-ups, that the collection came to fruition. At its core, the museum is described as an ever-growing collection of items, each a memento of a relations past, accompanied by a personal, yet anonymous story of its contributor. But also in Zagreb, is the unique Mirogoj cemetery, which as well as its historical significance, is considered one of the more noteworthy landmarks to visit, covering 72 hectares (177 acres) just outside the city. There are more than 350,000 people from all walks of life buried in Mirogoj, which is regarded as one of Europe’s most beautiful cemeteries. One minute you’ll be looking at a huge statue in memory of a Croatian historical figure and next door is a gravesite of a Jewish family. You will find the graves of Croatia’s most noble families, famous writers, poets, composers and architects. The magnificent cathedral, too, is not without a touch of the unconventional with its casino’s chandeliers mixed with so much history, and different artistic styles. The chandeliers came from the former Gold Coast Casino in Las Vegas, which was redecorating while, at the same time, Zagreb Cathedral was struggling with its old lighting system. A Croatian immigrant working at the casino urged his bosses to donate them to the cathedral, which gratefully accepted them. 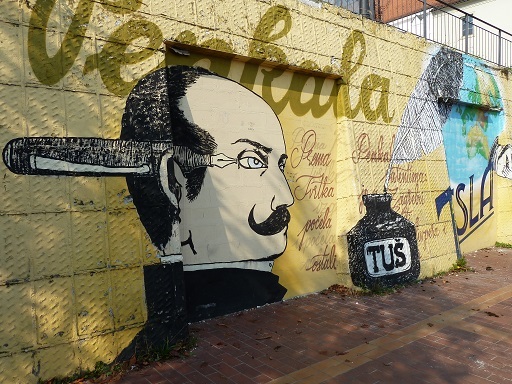 Murals or street art is widespread in Zagreb, but it’s certainly not frowned upon with commissioned work all over the city, including several adjacent walls of paintings of famous Croatian inventors, such as Slavoljub Eduard Penkala (pictured), who invented the first fountain pen and patented the ‘hot water bottle’; Nikola Tesla, inventor of the world’s first hydro-powered plant at Niagara Falls in 1895; David Schwartz, who invented the first Zeppelin aircraft; and a fingerprint of Ivan Vucetic, who invented the system of identifying people by fingerprints. 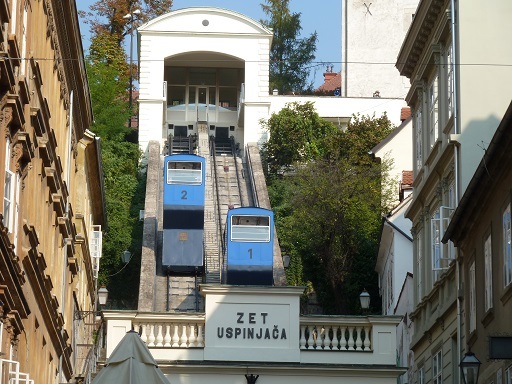 Zagreb’s first public transport is a 66-metre high ride on a funicular called Uspinjaca. From the main street – Ilica – in lower town, the shortest funicular in the world it takes people to the Baroque upper town to admire the city. Built in 1890, over an old city vineyard (vines are still growing), it takes just 64 seconds to reach the top, where you can climb the 13th century Lotrscak Tower to watch a canon fired at noon. From museums and upmarket shops to micro-breweries, ice cream shops and chestnut and corn vendors, it just about has everything. Vincek – the most popular ice cream shop – sells 40 different flavours – the most unusual being pumpkin. Another delicacy found on Ilica is called bajadera, a Croatian delicacy made of praline nougat enriched with almonds, hazelnuts and/or walnuts. Zagreb’s main form of transport – its steely blue electric trams – run up and down Ilica and to all corners of the city, which boasts 4500 restaurants, cafes and coffee houses with one on almost every street corner, according to my well-informed guide. At the top end of Ilica, you’ll find the ‘Zagreb 360 degrees’ observation deck from where you get a bird’s eye view of the city’s commercial hub – Ban Jelacic Square – its busy market and the soaring twin spires of the cathedral. 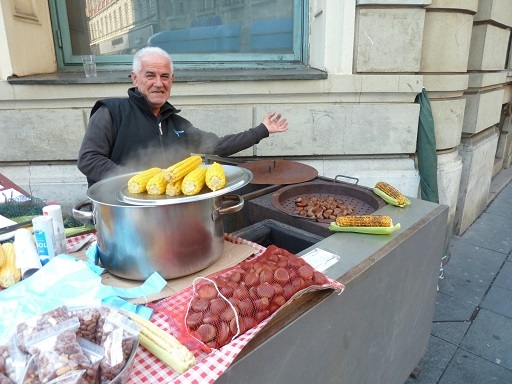 Not to be missed is the big, colourful farmers’ market – called Dolac – located on a roof terrace above Ban Jelacic Square. It’s a beehive of activity from early morning to mid-afternoon flaunting top quality food from all around Croatia, as well as souvenirs – the most popular being shirts of Luca Modric, the Croatian footballer who plays for Real Madrid and just recently won the Ballon d’Or ‘(Golden Ball’). For a break from the city, Samobor, a half-hour drive away, is one of the best-preserved medieval towns in inland Croatia. It’s famous for ‘kremsnita’ (custard cake) and ‘cesnjovka’ garlic sausage) – either/or both washed down with bermet, an aperitif made of red wine, spices and fruits, which, according some to some, was served on the Titanic.